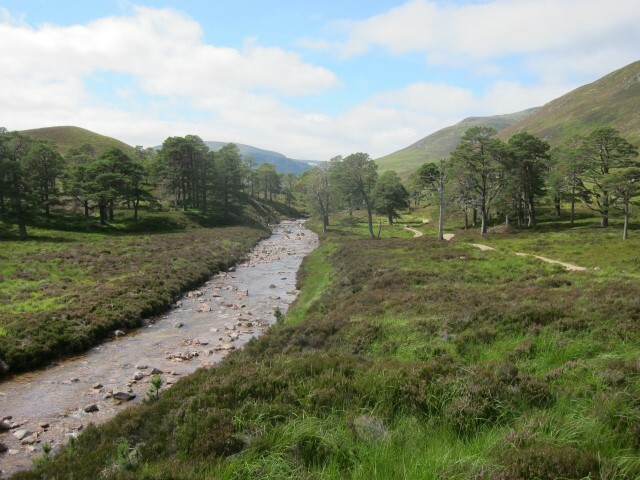 Glen Lui is arguably the most beautiful of all the glens off the upper Dee and a Walkopedia favourite. 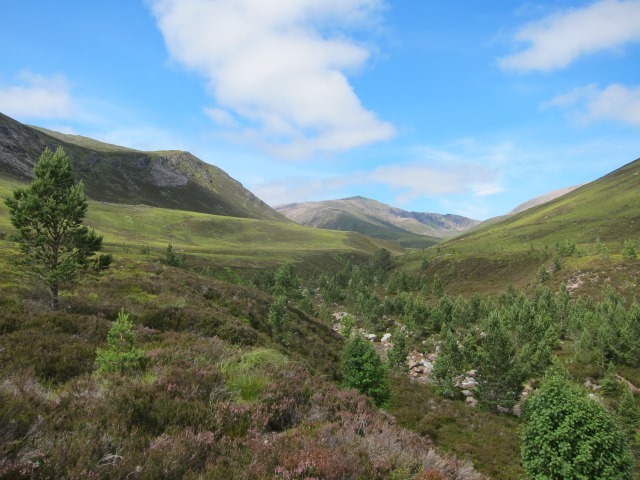 Make a shortish circuit by crossing between Glens Lui and Quoich, or a longer one by crossing from upper Glen Lui into the wild upper Dee valley and circuit back down. 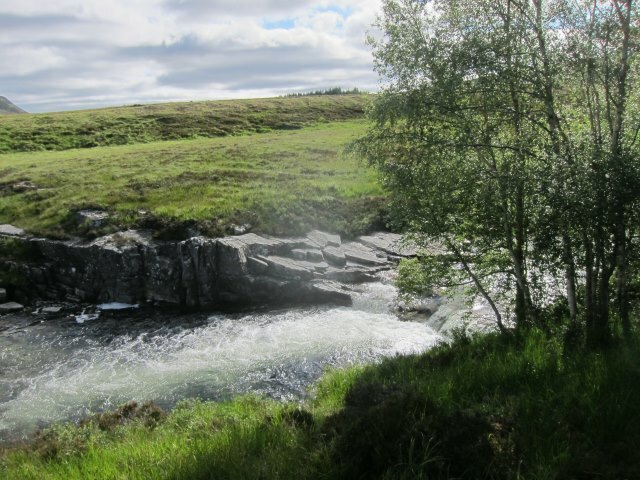 The glens north and south of the upper Dee valley are all marvellous, and Glen Lui arguably the most beautiful of all and a Walkopedia favourite. 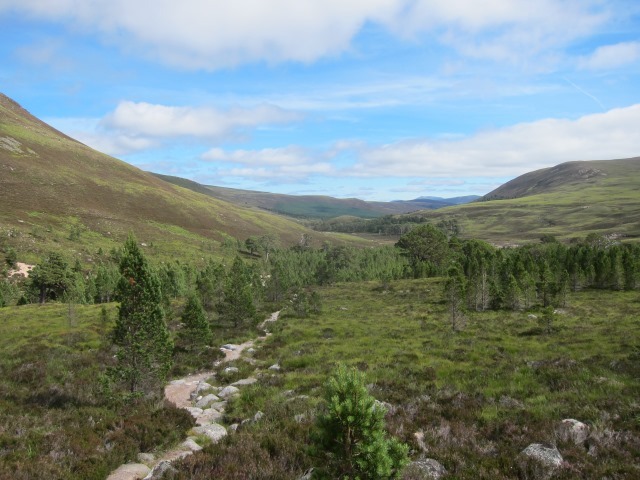 Through it runs an ancient drovers’ road, along which cattle would be driven from their highland homes to the markets of the lowlands after passing through the Lairig Ghru. It still has a certain atmosphere, and you can think on the lives (and, up here, hardships) of those who followed the track. 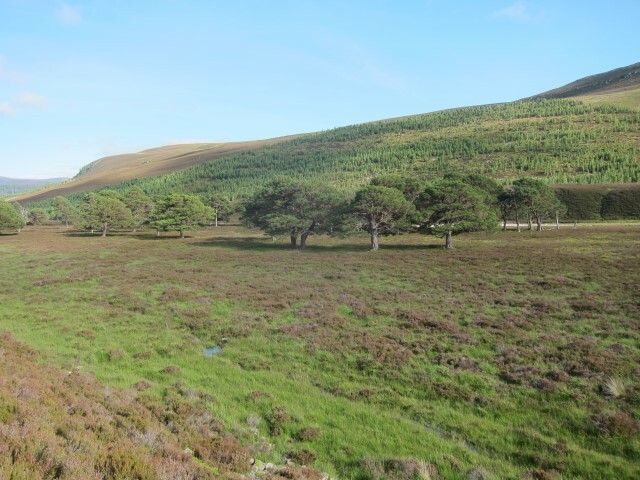 The glen is dotted with the remains of the ancient Caledonian forest, widely spaced Scots pines interspersed with birch and rowan and carpeted with heather. 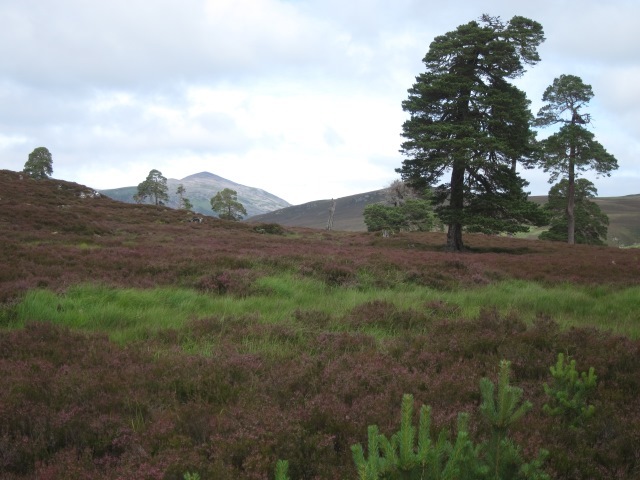 The hillsides are (of course) clothed in trademark heather. High above are moorland, peaks, beetling crags and purple hillsides. 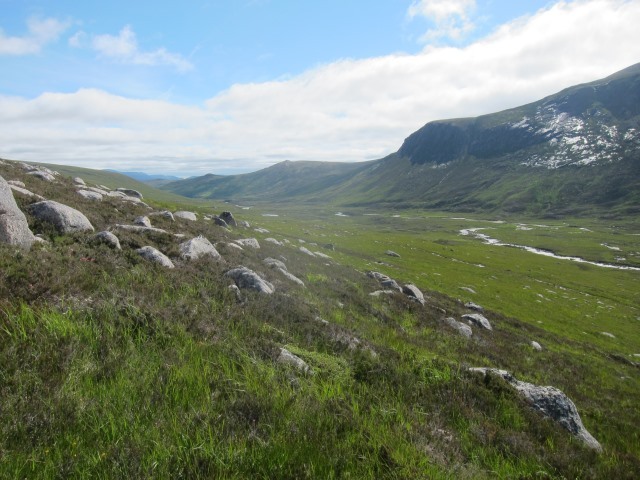 The central Cairngorm NP is a huge, roadless, protected area teeming with precious wildlife and rare and delicate plants. Wildlife includes eagles, ptarmigan, deer and mountain hares. 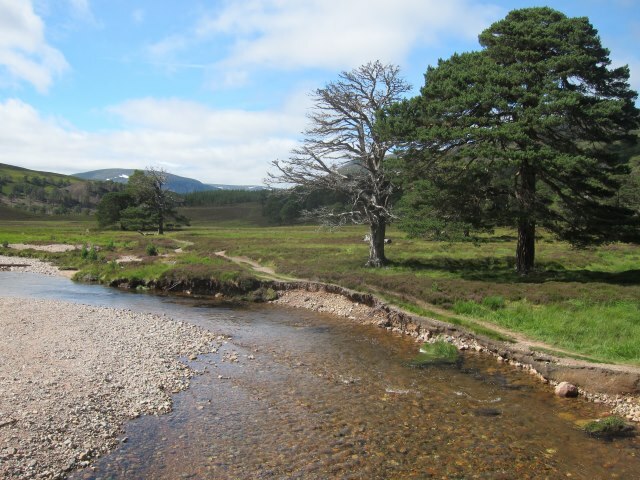 The track starts from the roadhead at Linn of Dee, and is delightful within minutes, winding through ravishing open Caledonian forest. 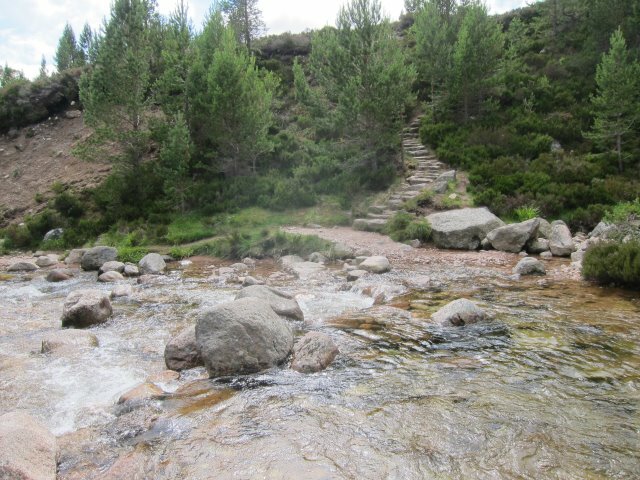 It emerges into the gorgeous glen, reaching Derry Lodge (a perfect place for a picnic under the pines by the river) at the junction of Glens Derry and Lui in 1 ¼ hrs or so. 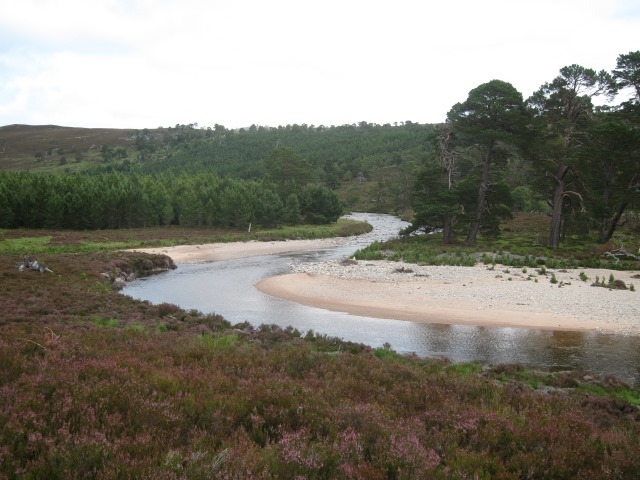 A drove road heads up Glen Derry to cross the high Cairngorms to Glen Avon and, eventually, Speyside. 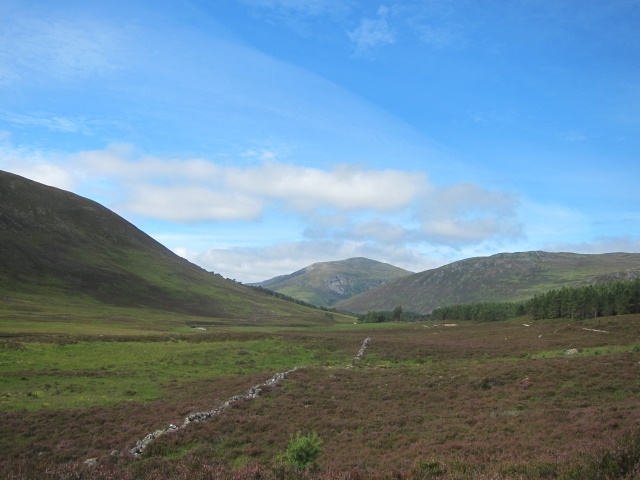 Upper Glen Lui is, if it is possible, even more beautiful than what you have seen so far. 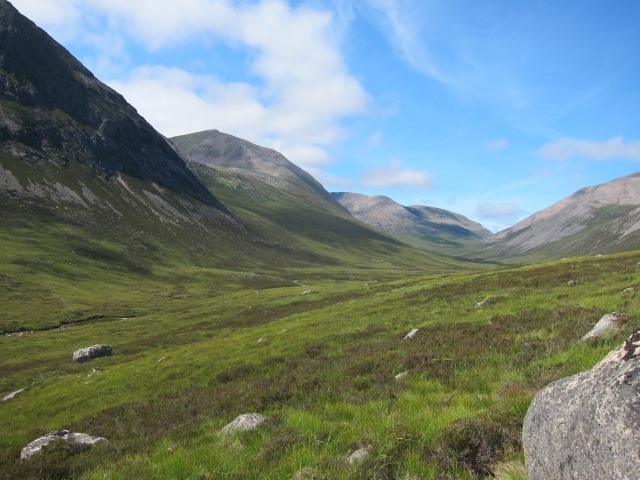 A bit under an hour or so above Derry Lodge, the glen swings north into the heart of the massif, providing a fine access route to Ben Macdui in particular. A bit further on, you can turn off to make a steep ascent of Carn a’Mhaim. 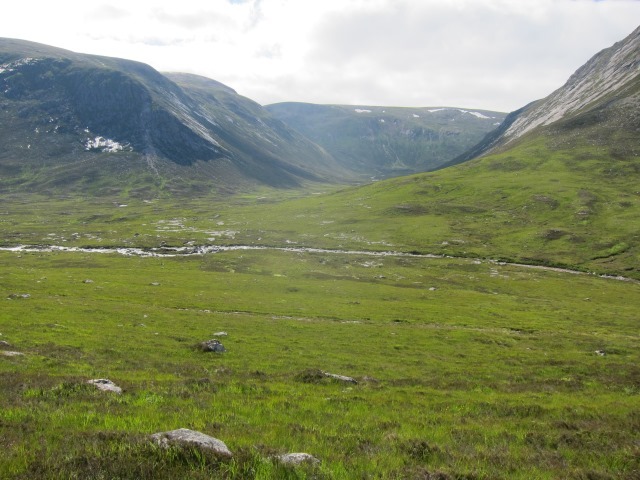 The drove road crosses the burn where it turns north, and heads west over a mountain flank into the upper Dee valley where it flows below the great crags of The Devil’s Point, Cairn Toul and the Ben Macdui/Carn a Mhaim ridge, narrowing to the north into the Lairig Ghru. 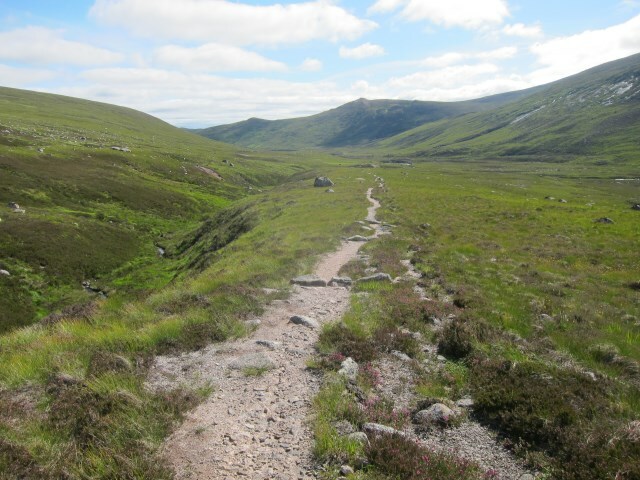 You can make a shortish (4hr or so) circuit by crossing between Glens Lui and Quoich via a narrow, shallow, reedy, loch in a slightly weird ridge-top fissure, or make a longer one (5hrs or so) by crossing from upper Glen Lui into the wild upper Dee valley and circuit back down to the Linn of Dee. A very delightful walk. 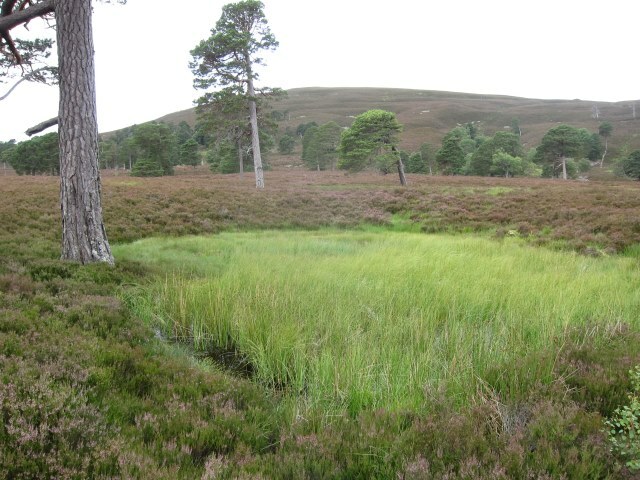 It is possible you will meet no-one once you have got a few hundred metres from the road. 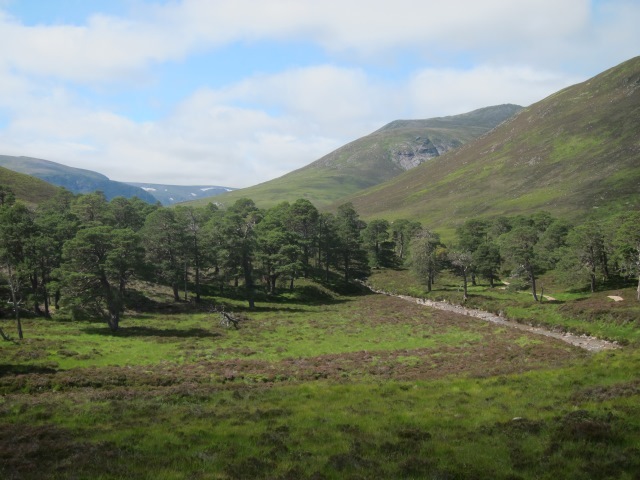 This is a remoteish walk in mountains, with always unpredictable weather. Come prepared. 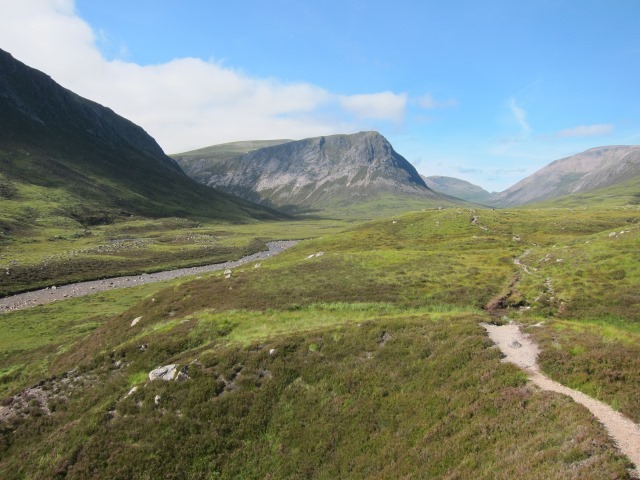 The Cairngorms: Walks, Trails and Scrambles – Cicerone. As usual, a brilliantly researched book covering 102 fantastic walks of all shapes and sizes, including several on Ben Macdui. 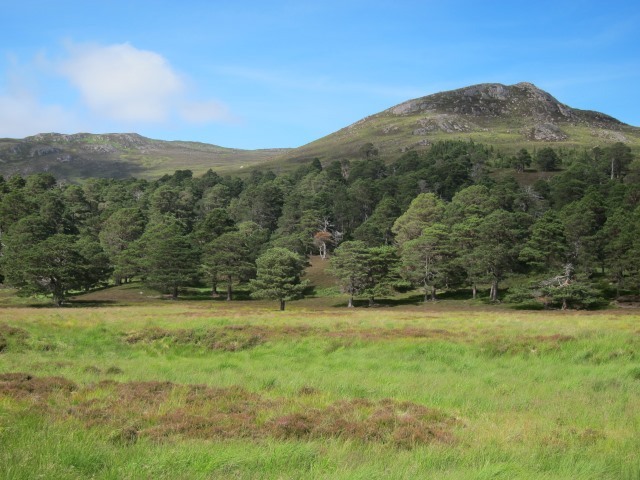 SEE OUR CAIRNGORMS PAGE FOR FURTHER INFORMATION (INCLUDING PRACTICALITIES AND PHOTOS) ON AND OTHER GREAT WALKS IN THE AREA.